Every number except two was larger than its respective average from Urner Barry’s pre-report survey of hog market analysts. 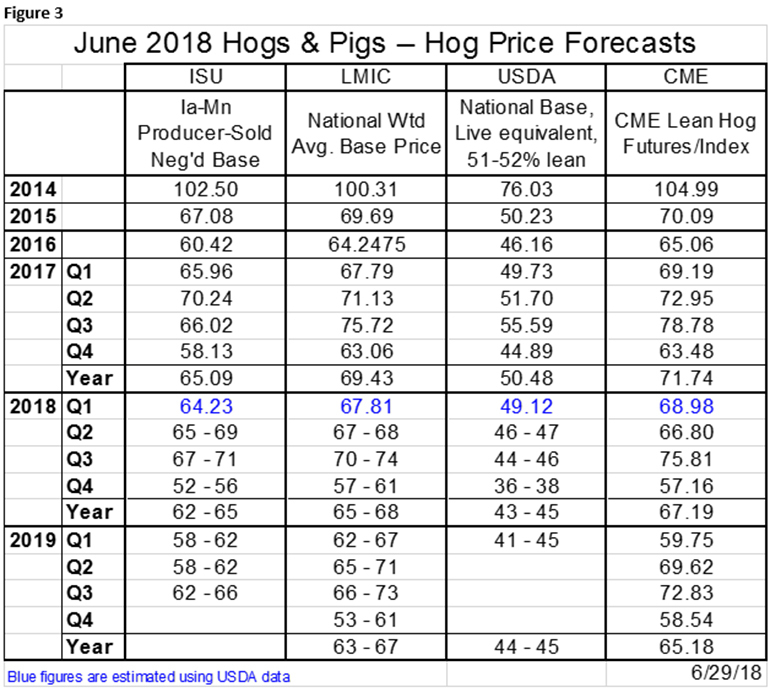 Thursday’s Hogs and Pigs report from the USDA was without a doubt bearish and one of the more shocking reports we have seen in a while. Figure 1 shows the national numbers from the report. Note that every number except two was larger than its respective average from Urner Barry’s pre-report survey of hog market analysts. 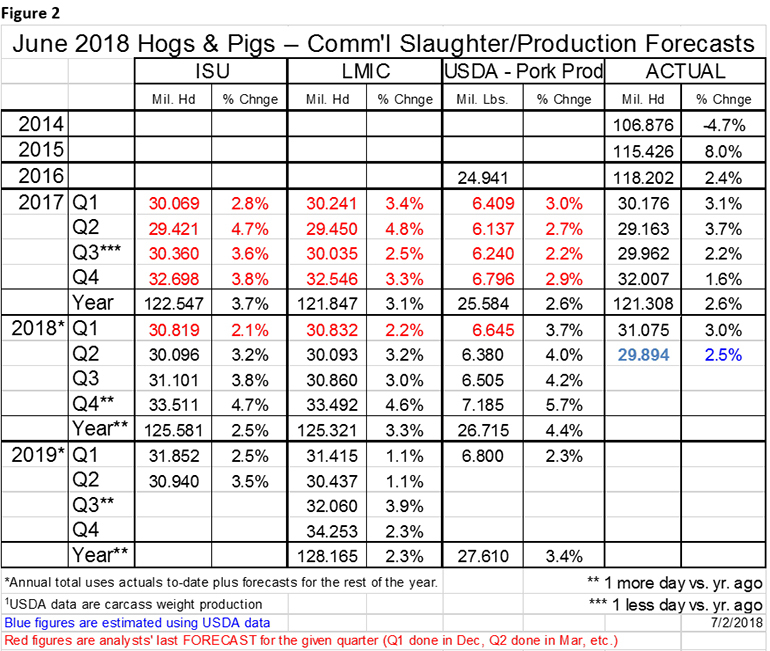 The 180-pounds-plus market hog inventory change, at 2.4% was within 0.2% or so of the year-on-year change in June slaughter after adjusting for the number of weekdays and Saturdays this year versus last year. The inventories of pigs weighing under 120 pounds were a bit larger than expected, but not dramatically so. That’s not true for the 120-to-179-pound category and this difference is important. Much of the talk about a summer rally this year has been predicated by the belief that this winter’s higher incidence and severity of porcine reproductive and respiratory syndrome losses. The University of Minnesota’s Morrison Swine Health Monitoring Project confirms the higher incidence but the difference from recent years ran about 5% for most of the spring. Noticeable for sure. But significant? We have no way to determine whether the severity of the breaks was worse, but I know several producers who went through them who will certainly attest to their severity. Will the losses be noticeable by the time the cohort pigs reached market weight? That has always been the question and this report says that not only did plenty of pigs survived but there were so many more to start with that we will see mid-July through early September numbers nearly 4% larger than last year. That number is a full percentage point higher than analysts expected and it didn’t appear to me that analysts’ 3.1% average for year-on-year growth really allowed for much additional in the way of death losses. These market inventories pushed our supply forecast up slightly, but recall that we were already expecting very healthy increases this fall. Still do. The numbers appear in the table. The truly shocking number in the report was the breeding herd at 6.32 million head, 3.5% larger than one year ago. The industry increased the breeding herd over 3%, year-on-year, in December 2014 as the industry rebounded from porcine epidemic diarrhea virus issues. Before this large jump (which I would argue is a one-off situation due to PEDV), the last time the industry saw a 3% year-on-year change was March 1998. If that doesn’t send a chill down your spine, you are obviously younger than 40 or so or a newcomer to the pork industry who has never spent more than five minutes talking to an industry veteran. We long-in-the-tooth pig industry types find anything that mentions 1998 is closely akin to the grim reaper. But the USDA says not to worry about that breeding herd because a bunch of those sows aren’t going to farrow in the next six months! At least that’s what the Feds seem to say. But the USDA has missed farrowing low with their intentions estimates pretty consistently the last few years. We think it is likely they have done so in this report, likely by about 1%. That means pig crops in the second half of this year and slaughter the first half of 2019 will be larger than what the report suggests. See Figure 2 for production forecasts. Note that we have added the USDA’s pork production forecasts to Figure 2 and price forecasts to Figure 3. 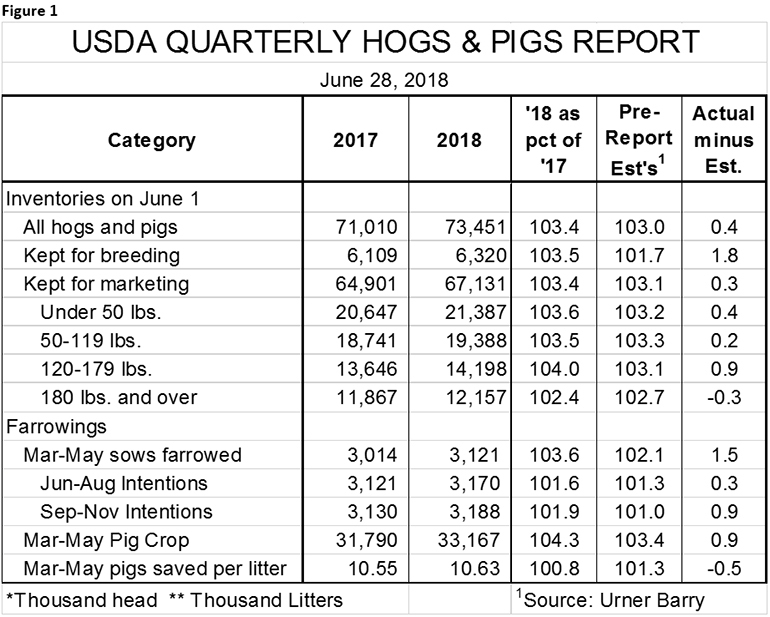 The numbers shown here are from the USDA’s June World Agricultural Supply and Demand Estimates and do not include USDA’s take on Friday’s Hogs and Pigs report. The first glimpse we get of the report’s impact on the USDA’s own forecasts will be in the July WASDE which will be released July 12. Also note that the USDA supply figures are million pounds of carcass weight pork production and that USDA’s prices are in dollars per hundred pounds of live weight. What does this mean for producers? We see it as a harbinger of a breakeven or slightly worse year in 2019. Futures prices have reacted surprisingly favorably the past two days and are still providing opportunities for profitable sales for much of next year, especially given what has happened to costs over the past 30 days. The Corn Belt has plenty of moisture for corn at present. The question will be temperatures as we reach the critical pollination stage. Heat always hurts, but it is often not damaging in the presence of plenty of moisture. The jury is still out on soybeans since August is their most critical weather period. Both markets bear watching but how much more gravy can be extracted? Slaughter capacity will be tight this fall but this report doesn’t make it significantly more so. We have four weeks at or beyond the 5.4-day capacity of U.S. plants without the second shift at Seaboard-Triumph. That shift is scheduled to begin Oct. 1, and some workers have already been hired. A second shift startup is easier than a plant startup for a lot of reasons but training is a big one. Having trained workers to help train new ones is a big deal. It is important for that plant to get running as there are hogs already on the ground that are headed that way. If it does get started on time, that will relieve any problem we might encounter this year. This report suggests that we will substantially fill STF’s second shift and the first shift at Prestage’s Wright County, Iowa, plant late next year. The U.S. packing industry is likely back to the old margin model of making money in the summer and losing money in the fall. That had generally not been the case the past five years when capacity was tight. Know your costs. Fine tune your production systems to get every ounce out of your farm. Decide how much risk you can stand. Get your banker and your spouse on board. Take action. As difficult as all of those are, the last one is probably the hardest, but you’ve been here before. Remember your history.